It is interesting the way worlds collide sometimes. My friend Andy has taken me up to the Mullin Museum in Oxnard before. We went up and looked at the most beautiful cars of the 1920s and 1930s. The sort of things that architects want parked next to the homes they design, so some of the breathtaking aesthetic rubs off on the viewers’ eyes. Their website (as of April 2013) is stunning. Peter Mullin is currently the curator of the Petersen Automotive Museum in Los Angeles as well. There are some insanely valuable cars there (the Bugatti Type 57SC Atlantic Coupe held the record for a little while for the highest-priced car at auction), but there is a Talbot-Lago Type 150-GS from 1937 that I could watch revolve on it’s little merry-go-round all day long. It is one beautiful French curve diving into another, every one of them finished off with gorgeous chrome detailing, all wrapping a little two seat passenger cabin. So Andy and I have been up there and talked cars, design, and lines that hang in space long after the designers are dead. Months before, on Kickstarter I heard about a project that was intriguing. 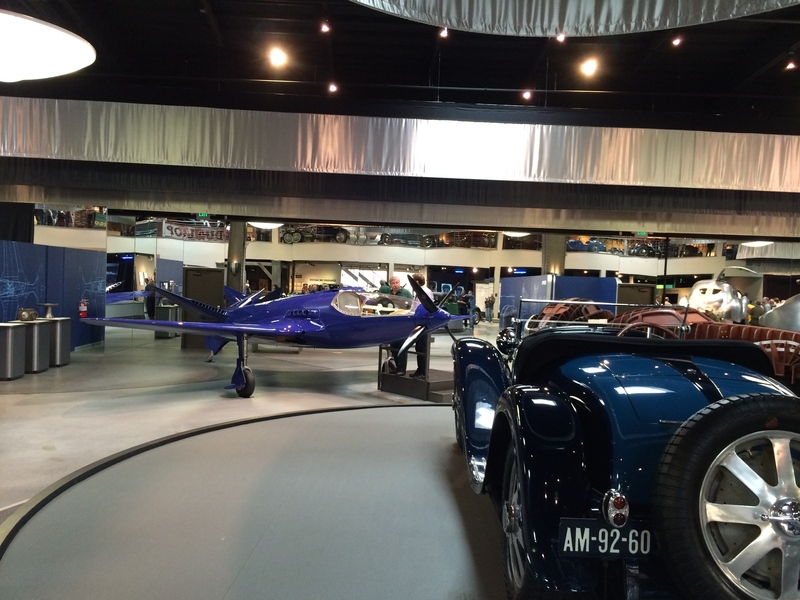 There was a plane that Ettore Bugatti designed in 1939 for airplane racing, the only plane he had ever designed. But before it was able to take its first flight, the Germans marched on Paris and, worried that it would fall into their hands, the only one ever built was stuffed into a barn outside Paris. After the war it was sold from one entity to another, never flying or being properly restored, until it ended up in the lobby of the Experimental Aircraft Association’s headquarters. The engines had been removed and it will never fly because portions of it can never be properly inspected for certification even in the experimental category. Enter the obsessives. 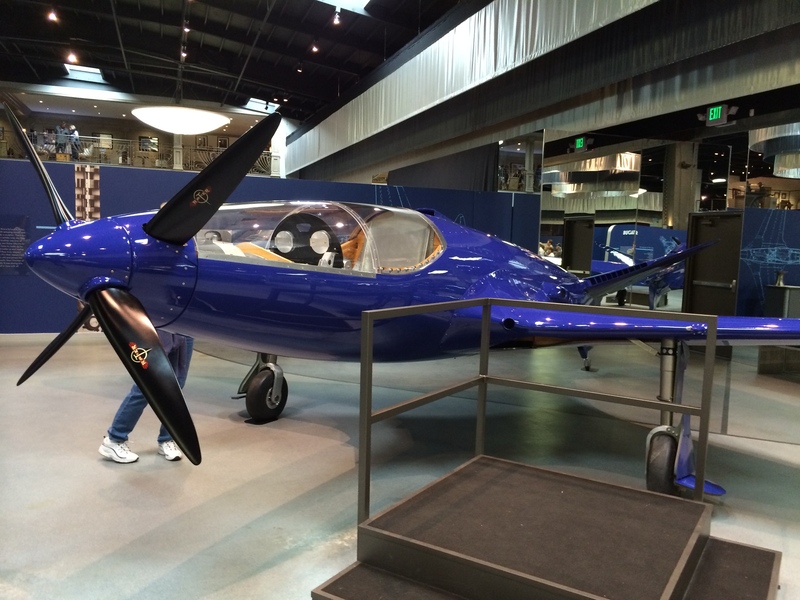 Scotty Wilson and John Lawson believed the Bugatti 100P should fly, so they started building one. They were allowed to take all the measurements they wanted of the EAA plane, and painstakingly started crafting their own air-worthy edition. They turned to Kickstarter when the project because more costly than they, or their sponsors, thought it would. I was happy to toss in the equivalent of a few gallons of AvGas, and couldn’t even remember what the “reward” was, other than constant updates on the progress. I really enjoy people who get up to their eyeballs in this sort of thing. Back to the Mullin, Andy and I wandered into the upstairs area of the museum where they had some furniture designed by the Bugatti family. Looking in one of the little glass cases I saw a toy model of the 100P. I snapped a photo and when I got home sent it to Scotty Wilson. “Look! 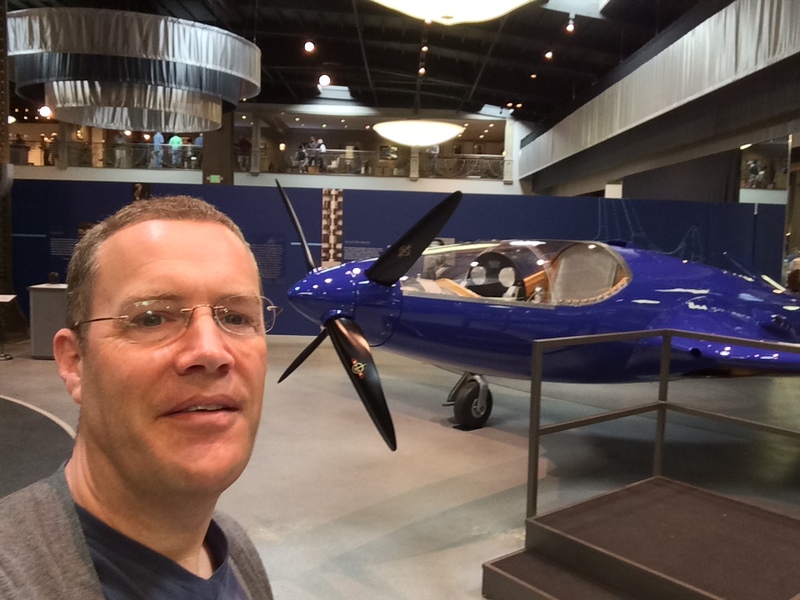 The Mullin Museum in Oxnard has a die-cast toy of the Bugatti plane!” I thought it was cute, but didn’t think much more than that. 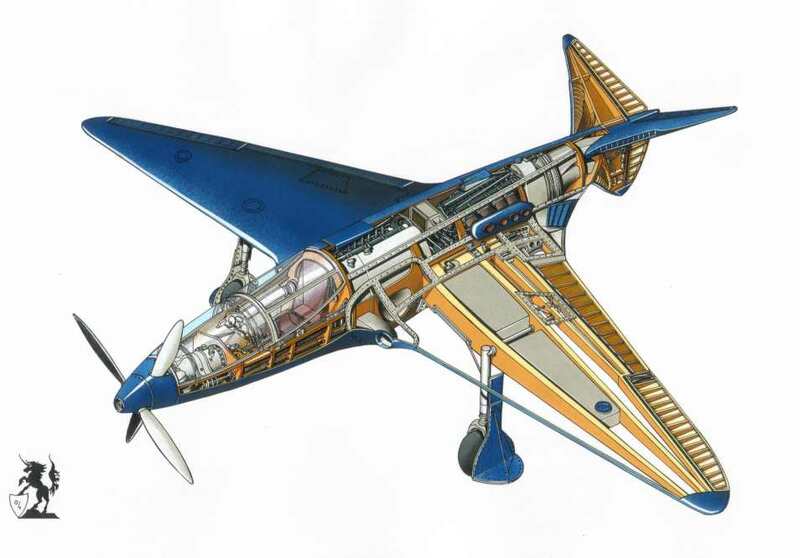 A couple months later I saw in my aviation news feed that the Mullin was going to have a show devoted to the Art of Bugatti and they would have the completed Bugatti 100P on display. I checked with Andy and he was in. So this morning I borrowed my friend Susan’s Tesla Model S (because car nuts going to a car museum should roll up the Pacific Coast Highway in something outrageous) and we hit the museum right at the ticketed time Andy had grabbed. We rounded a curved, blue wall and there it was. Absolutely stunning. So much smaller than I was expecting from all the photographs I had seen, it sits nose up since it is a tailwheel airplane. The blue could not be a more perfect Bugatti blue. The museum staff is really nice about letting people get their noses right up against the rolling art, as long as you don’t actually touch. Peering into the single pilot cockpit of the Bugatti 100P I saw they had names etched on the metal shield over the gearbox. 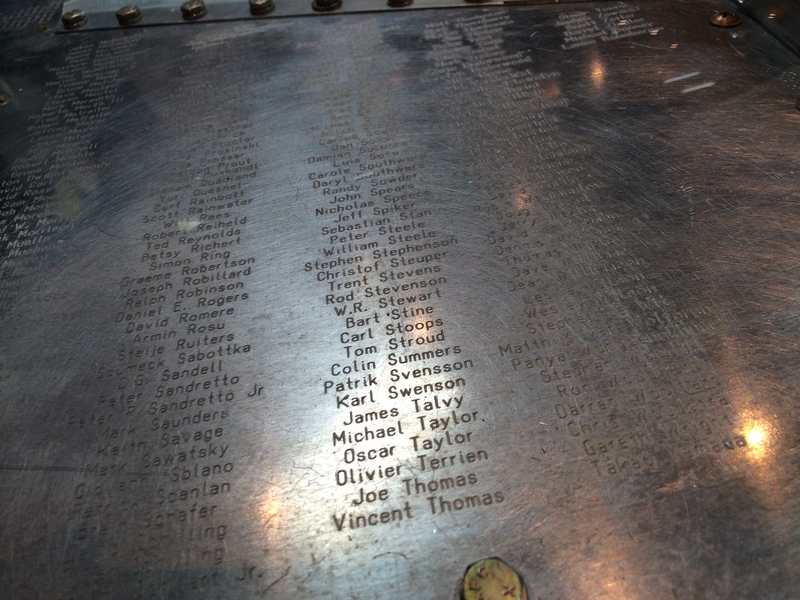 A lot of names. And then I saw mine, since I was a backer of the Kickstarter project. It is a twin-engine plane, but the propellers are both on the same axis. So both propellers in the nose, each turned by a separate engine. It seems monstrously complex to get that to work. Peering into the fuselage through the exhaust ports I saw it was completely empty and I couldn’t even make out the mounts for the engines. But according to their blog the engines are selected and installing them is the next step. As close as I’ll come to piloting it. On the way home I called Adam who asked if I would fly it. Not in a million years. That is experimental in every sense of the word, with the original designers long gone and unable to help with any control-of-flight issues. It was designed for air racing, so I imagine the performance at the upper bounds of safe speeds is good, but I always worry about the slower flight, when I am returning to the ground. I don’t want that to be the time we find out that the center of gravity is too far aft and the control surfaces are under-sized. But I loved seeing it, and it was so perfectly at home surrounded by all those other beautiful curves that Ettore drew.